A lot of my posts have been fairly technical recently, so I thought I’d address a little more of the creative side of photography. I love black and white photography, so I thought I’d explain a little about my vision for how I decide if an image will be converted to black and white or not. 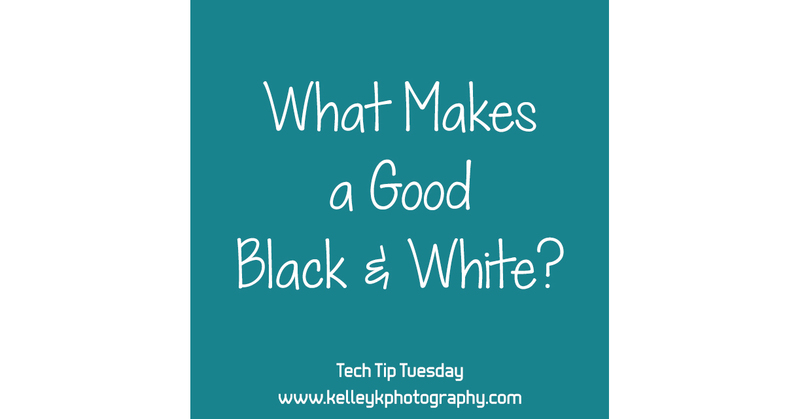 There are three main things I look for when determining whether to convert an image to black and white. I hope you enjoy this post. I’ll cover some tips on editing black and white images in a future tech tip! The light is very important to making a good black and white. If you’ve ever had a black and white conversion that looked drab and gray, the chances are the light just wasn’t there for a good conversion. Dramatic light lends itself very well to black and white, because it gives a lot of contrast between the light and dark parts of the image. It also often has a moodier feel to it that seems more raw when you strip the color away. The reason good light is so important is that it gives you a wide range of tones in your image. You want to have a range of tones in your image from bright to dark. If the light is ideal, you’ll automatically have a nice range of tones because it will be very bright where the light is hitting and very dark in the shadows far from where the light is falling. In less ideal light, you may have to accentuate the range of tones when editing so that you can darken the shadows/blacks and brighten the lighter areas. A good black and white conversion can really bring out the texture in an image. Things like water, hair, plants, concrete, and food often have great textures for a black and white conversion. Stripes, polka dots, or other geometric patterns can also add interest in a black and white image. There’s a macro picture in the gallery of a serving platter with a really neat circular pattern that I took knowing I’d convert it to black and white. By converting an image to black and white, you can remove a lot of distracting elements from the frame. It removes distracting or competing colors, and background items often fall into shadow and completely disappear. This brings the attention to your subject, the light, and the emotion in an image. Converting to black and white can also give a timeless feel to the image by stripping away modern colors and details, and giving the look of an old black and white image. Color can also be a distraction in situations where you have indoor or mixed lighting or where there are strong color casts, and converting to black and white can simplify the image by removing these undesirable colors.